I wanted to share what I am doing with Zentangle art on quilts. A few years ago my sister introduced me to Zentangle. I am a quilter and thought if it can be done with a pen; it can be done with my sewing machine. 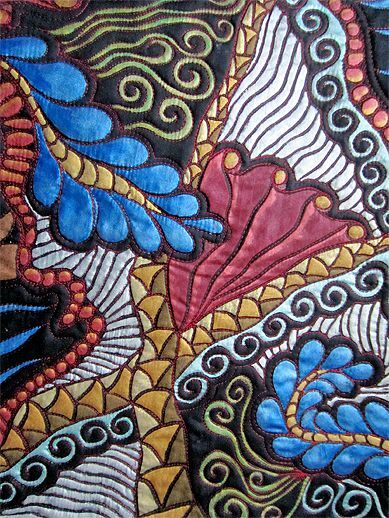 I usually start with black fabric and quilt improvisationally and then paint with Lumiere opaque paints. Thank you for sending those pictures, Sandy! Intricate designs will delight your senses and inspire your creative spirit as you view Esther Piszczek's Zentangle inspired artwork. 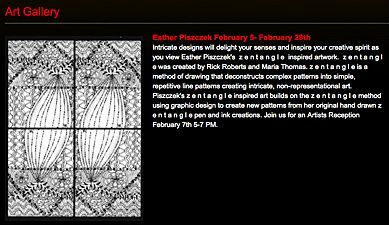 Zentangle was created by Rick Roberts and Maria Thomas. Zentangle is a method of drawing that deconstructs complex patterns into simple, repetitive line patterns creating intricate, non-representational art. 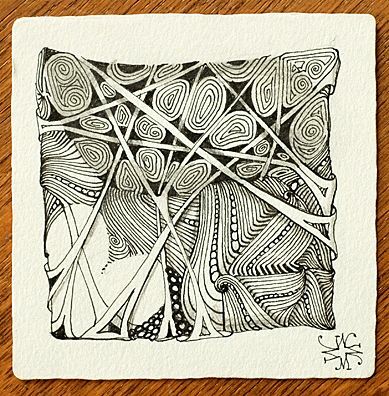 Piszczek's Zentangle inspired art builds on the Zentangle method using graphic design to create new patterns from her original hand drawn Zentange pen and ink creations. Join us for an Artists Reception February 7th 5-7 PM. Thank you everyone who came out to the Red Mug on February 7 to see my newest exhibit. Suzanne Johnson, owner of the Red Mug Coffeehouse, Bakery and Caf�, created many delightful treats, including Zentangle(R) inspired art cookies and provided wine for all those who came in from the cold. It was a very enjoyable evening. I've attached a few photos of the show, including pics of one or two of my newest pieces. The show will hang until February 28th so there is still time to see it and enjoy the relaxing atmosphere and yummy food at the Red Mug, 916 Hammond Avenue, Superior! We saw an article from The Simmons Voice, the newspaper of Simmons College in Boston, Massachusetts. 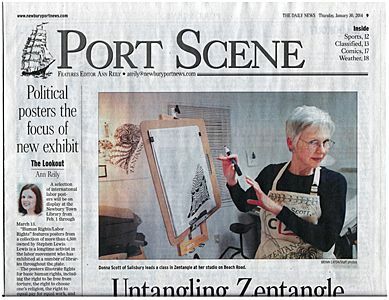 Attached is a copy of an article in our North Shore local paper today, the Newburyport Daily News, featuring Zentangle classes by one of your CZT students . . . Me! 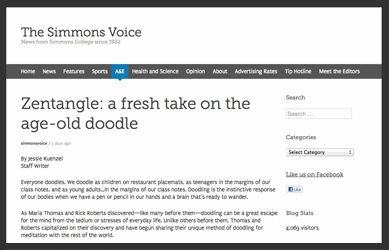 Linda Farmer, CZT, has an occasional series in which visitors to her site, tanglepatterns.com, describe in their own words how practicing the Zentangle Method has impacted their lives. "I was recently diagnosed with Parkinson's Disease so it was incumbent on me to get off of as many [anxiety] drugs as possible so I could clear the way for further prescription help with the Parkinson's. Little did I know that Zentangle would be my sole help during these months of withdrawal from my medication for anxiety. "Each time I felt the very unpleasant withdrawal symptoms come on I would sit down in my easy chair and begin drawing tangles. "By the way, one would think that having Parkinson's Disease with all the hand and body shaking, one couldn't begin to tangle. I beg to differ . . . Zentangle has changed my life. I can now write, as before my signature came out very tiny or illegible (micrographia). The constant drawing has rewired my brain to accept hand-to-brain signals and has even helped me to do more things I couldn't do before, like typing on the computer. "I started back into watercolors, colored pencils, pen and ink and more. I haven't been able to hold my hand still long enough for over two years, maybe more. Now that I have completely come off my anxiety medicine I have a better outlook towards my artistic nature. I want to paint and draw even more. 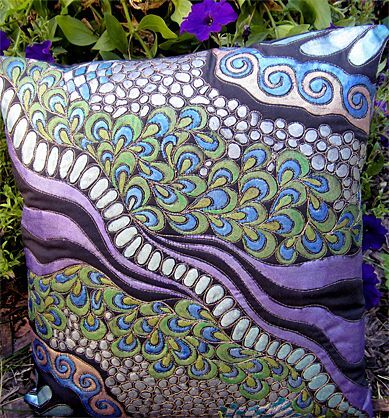 I believe Zentangles has reopened my natural God given talents in such a wonderful way." 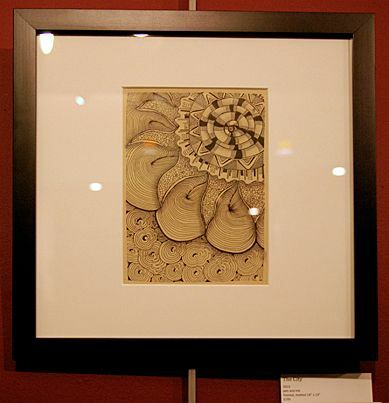 Go to this link to read Debbie's complete story and see one of her Zentangle Inspired Artworks. 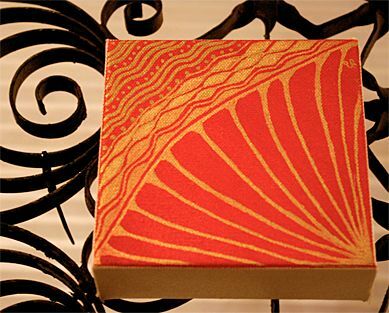 If you know of any institutions that are interested in studying the Zentangle Method, we are happy to work with them. We do not make any claims for the Zentangle Method other than to suggest that by practicing it, almost anyone can create beautiful art and have fun doing it. And when you think about it, that's pretty wonderful! Along with showing off this exquisite tile, I want to point out what Maria did with her hollibaugh on this tile. Notice how that tangle splits and stretches and wraps around the string borders. Hollibaugh, along with crescent moon, are two or our primary teaching tangles because they demonstrate two main tangling techniques, "drawing behind" and "aura-ing" respectively. It' wonderfully inspirational to be reminded from time to time how much can be done with basic tangles that everyone "knows." Don't you just want to grab a tile and your pen and pencil and try this out? Split . . . Stretch . . . Wrap! Take a look at some more hidden Valentines on our recent blog, Spiral Love. Thank you for so generously sharing your creativity and comments with us and with others. And thank you for welcoming us to your inbox!